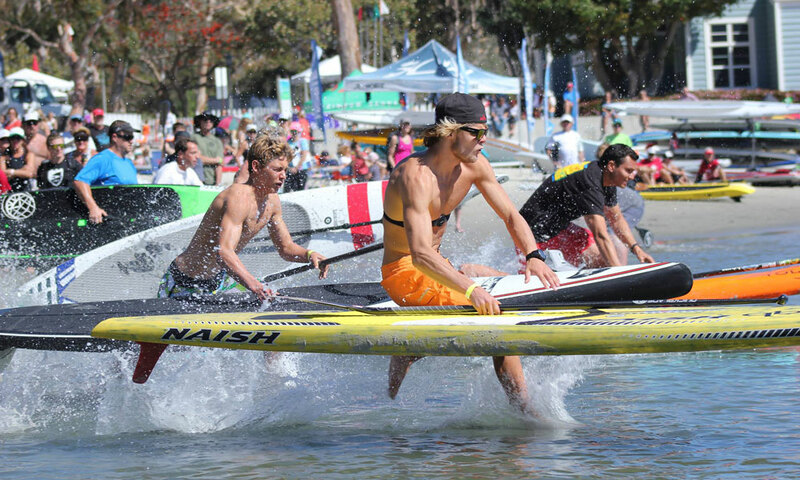 The Danish Viking, Casper Steinfath, has showed strong early season form by claiming the Mickey Munoz Mongoose Cup in Dana Point yesterday. While the Mongoose Cup draws hundreds of paddlers and is more about celebrating the sport of SUP in general, rather than just being a pure race, the focus was on the sprint race final after Casper created the photo of the day with his lightning start. Looking like he was holding a hover board instead of a SUP, Casper fired off the line and never looked back, crossing the line ahead of the speedy dark-horse Sean Pangelinan (expect to see that name more this year…). Filling the minor places were young gun Noa Hopper and Frenchman Greg Closier, who seems to spend as much time in California as he does in France. Meanwhile in the women’s race it was another younsger Shae Foudy who took the honours at Dana Point’s Baby Beach. The Mongoose Cup also included a big paddle out tribute to Bob Risner, a very popular figure in the SUP community who passed away last month. As always, OnIt Pro has quite literally thousands of pics of the event up on Facebook. Here’s gallery 1, gallery 2 and gallery 3.